India captain Virat Kohli plays a shot during his side's first one-day international against New Zealand at the Wankhede stadium in Mumbai on October 22, 2017. 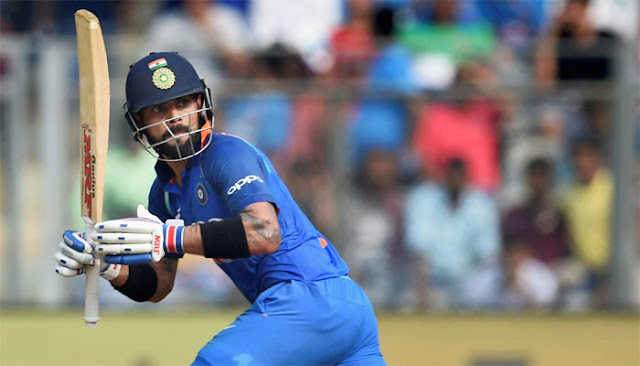 MUMBAI - Virat Kohli scored a century as India finished on 280-8 against New Zealand in the first one-day international at the Wankhede Stadium in Mumbai on Sunday. The Indian captain smashed 121 off 125 balls, including nine fours and two sixes. Trent Boult grabbed four wickets for New Zealand. Virat Kohli scored a century as India finished on 280-8 against New Zealand in the first one-day international at the Wankhede Stadium in Mumbai on Sunday. The Indian captain smashed 121 off 125 balls, including nine fours and two sixes. Trent Boult grabbed four wickets for New Zealand.